What Determines the Value of a Traumatic Brain Injury Claim? Prior to the NFL class-action suit, the danger of TBIs was not as well publicized, because though athletes had always suffered concussions, it seemed like a normal part of playing a contact sport. That’s no longer the case, as more and more athletes are revealing permanent brain damage from what they believe were repeated TBIs that were either improperly diagnosed, improperly treated or completely ignored. According to the Centers for Disease Control and Prevention (CDC), an estimated 1.7 million people in the U.S. suffer a TBI each year, and 52,000 people die as a result of a TBI. Annually, 30 percent of deaths related to injury in the U.S. are caused by a TBI, and concussions account for a whopping 75 percent of all TBIs. Clearly, TBIs have become a big problem, and that’s triggering an increase in legal claims related to these types of injuries. But before diving into how the value of a TBI claim is determined, it is first important to understand what these injuries are and how they are caused. When a person suffers a TBI, it refers to any kind of disruption of the function of the brain, typically as the result of some type of trauma to the head like a blow, a jolt, a bump or another type of blunt force. The key aspect of a TBI is that it negatively affects the brain’s normal function, even if it is only for a few minutes. Mild TBI – people who suffer a mild TBI can typically open their eyes spontaneously, respond well to normal conversation, and their motor responses are close to normal. Some symptoms of this type of TBI include headache, fatigue, sensitivity to light, nausea, and inability to sleep. Moderate TBI – people who suffer a moderate TBI typically black out after the initial head trauma, and they often exhibit confusion and memory loss as well as impairment in their motor responses. Severe TBI – people who suffer a severe TBI generally lose consciousness for several weeks or several months after the initial head trauma. This is the worst type of TBI, because patients are often either in a coma, or they exhibit minimal responsiveness to external stimuli, such as touch or the sound of voices. But despite these three categories, doctors caution anyone who suffers from a TBI that ‘mild’ is simply a term used to describe neurological impairment, and that every TBI should be taken seriously. The reason is that any type of TBI short-circuits the way the brain functions and sends out messages. Even a mild TBI can set the stage for a much worse brain injury if a person suffers a second head trauma. The most common causes of TBIs are falls, car accidents, assault, and head trauma through some type of activity – such as playing a sport. When people fall, they often lose their ability to cushion that fall, and if they strike their heads against a hard surface, that can easily generate enough force to cause a TBI. That is also the case when a person is involved in a car accident caused by another driver that results in head trauma. But TBIs are also problematic when it comes to an assault during a fight, because a fist or another type of weapon striking a person’s head can cause a mild, moderate or severe brain injury. 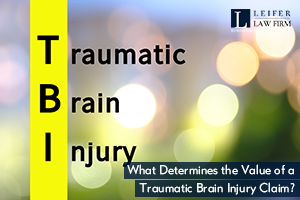 What Determines the Value of a TBI Claim? Medical Bills – depending on the severity of your TBI, you may have to spend weeks or months in a hospital, and even when you are released, you will still have to visit your doctor for follow-ups. Medical bills also include money spent for prescriptions, rehabilitation, physical therapy and caregiver services. Loss of Income – when people suffer moderate or severe TBIs, they are often forced to miss time at their jobs. A TBI claim can factor in loss of income as part of the claim, which can include permanent loss of income if the injury is severe enough that you can’t return to work. Miscellaneous Expenses – this can include transportation costs for doctor’s appointments, physical therapy appointments, and visits for things such as filing for workers’ compensation claims or filing for other types of benefits. Pain and Suffering – although this may seem like a catchall term, pain and suffering as it relates to a TBI is all about how the injury has changed your normal lifestyle. In other words, if the injury has forced you to change your social relationships and activities, you can document that through witness and doctor’s reports, and that can be factored into the claim as part of your pain and suffering. It’s no secret that public awareness of TBIs is at an all-time high due to the issues related to concussions and the National Football League. And with that awareness, people are more knowledgeable when it comes to liability regarding these types of injuries. If you or someone you love has suffered a TBI that was caused by third-party negligence, you may be entitled to compensation for medical bills, pain and suffering and loss of income. But to ensure that you obtain rightful compensation, you need to hire an experienced law firm, such as the team at Leifer Law. We have spent years handling these types of claims, and we understand the complexities involved in pursuing legal action for negligence. Please call us today at 561-660-9421 for a free legal consultation.